I don't often leave the quirky little island. That is, the Island City. Everything is here, I generally don't have to go further than I can walk, and if I do, it's usually only because we have to carry more than is comfortable. If that sounds like Small Town America, it is. In this case, I'm smack dab in the middle of the giant sprawl called South Florida, in a little city called Wilton Manors. Kind of a cross between Mayberry, a Beach Party, and a lot of things. Idyllic, well not entirely, but I will say that every time I read the police blotter, most of the "Perps" are not residents. I am not fond of that sort of import. We'd had a house guest over the weekend, and we also had a number of errands that simply had to get run. Unfortunately that also meant being in traffic. This being South Florida, there were a lot of really insane moves on the street. I have to say I could never be a traffic cop, I'd spend all my free time sitting in court listening to how this case needed a delay for some trumped up reason by a shyster connected with a traffic "school" after having written a ticket to someone who made a right turn from the left lane across four lanes of traffic. Snowbirds, please don't forget that the Universal Vehicle Code also is in force here too, just like back in Ohio, or Quebec, or some other colder spot. After being stuck in traffic at the beach, twice in one day, and on I-95 in a 3 mile tailback, I pulled out the camera. It started innocently. I took a picture of the back of a sealed tractor trailer and emailed it to my sister, still infatuated with the newness of having a new phone with an excellent camera, and the 1 GB of wireless data to use it with. "Hi Pat, this is what South Florida Looks Like Today". I sent her pictures of flowers and so forth later on after I calmed down. But that is what I tend to do when I am in the Navigator seat. I'm now fiddling with mapping programs, predicting traffic, making video, and taking pictures. After the second day of this I now understand why Millennials are constantly fidgeting with their phones when they're "idling". Traffic is never exciting for anyone. But add a passing eye for a pretty shot, some incredible weather, a good conversation with the driver, and I managed to fill up the chip with lots of shots. I also learned that I could silence the lens. Night shots from a moving car with a silent shutter meant that I got about 5 times more pictures than I expected. 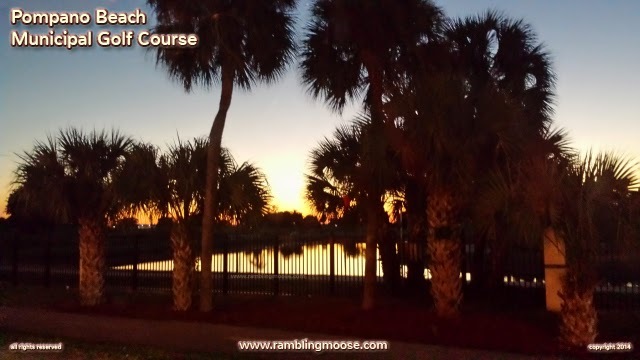 Coming back past the mall, I passed by the Pompano Beach Municipal Golf Course and even my jaded eye was surprised at the sunset. As I got shot three, I heard "Boy that is a beautiful scene! Did you get any pictures?" Yes, from a moving car, with a cellphone camera, and night photography. No tripod needed, the software has gotten that good when coupled with a fast processor. It's even easier than the old film days and the ASA 400 nonsense. Unfortunately, you still get blur from motion. A Fast Processor helps but it isn't perfect. But it does help to keep you from being bored when you are stuck in traffic.